Researchers tracked the personal daily online activity profiles of nearly 15,000 college students as they logged into campus servers. 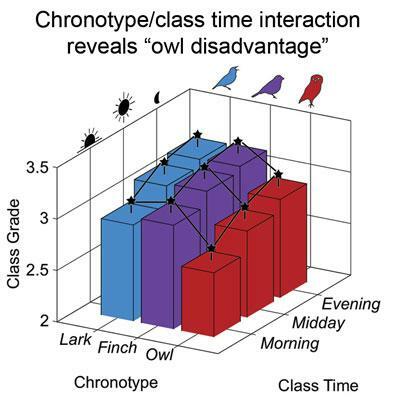 After sorting the students into "night owls," "daytime finches" and "morning larks" — based on their activities on days they were not in class — researchers compared their class times to their academic outcomes. Their findings, published today in the journal Scientific Reports, show that students whose circadian rhythms were out of sync with their class schedules – say, night owls taking early morning courses – received lower grades due to "social jet lag," a condition in which peak alertness times are at odds with work, school or other demands. "We found that the majority of students were being jet-lagged by their class times, which correlated very strongly with decreased academic performance," said study co-lead author Benjamin Smarr, a postdoctoral fellow who studies circadian rhythm disruptions in the lab of UC Berkeley psychology professor Lance Kriegsfeld. On a positive note: "Our research indicates that if a student can structure a consistent schedule in which class days resemble non-class days, they are more likely to achieve academic success," said study co-lead author Aaron Schirmer, an associate professor of biology at Northeastern Illinois University. "Because owls are later and classes tend to be earlier, this mismatch hits owls the hardest, but we see larks and finches taking later classes and also suffering from the mismatch," said Smarr. "Different people really do have biologically diverse timing, so there isn't a one-time-fits-all solution for education." In what is thought to be the largest-ever survey of social jet lag using real-world data, Smarr and Schirmer analyzed the online activity of 14,894 Northeastern Illinois University students as they logged in and out of the campus's learning management system over two years. To separate the owls from the larks from the finches, and gain a more accurate alertness profile, the researchers tracked students' activity levels on days that they did not attend a class. Finding these patterns reflected in students' login data spurred researchers to investigate whether digital records might also reflect the biological rhythms underlying people's behavior. The results suggest that "rather than admonish late students to go to bed earlier, in conflict with their biological rhythms, we should work to individualize education so that learning and classes are structured to take advantage of knowing what time of day a given student will be most capable of learning," Smarr said.